Serial Printer Logger can replace your old dot-matrix printers and collect data in real time to a binary log file, a PDF or a MS Word electronic document. This replacement will save your money that you'll spend for paper, consumables and maintenance. The program parses ESC/P control codes, decodes graphics and extracts information about fonts type and size from a binary data flow. So you can reprint documents later or create a backup copy. Serial Printer Logger provides data capture from printers that connected via RS232, RS485 or Ethernet. What problems can be solved with Serial Printer Logger? A typical application for Serial Printer Logger is to replace one or more dot-matrix printers with one PC that will capture and store documents electronically. Getting started is easy. Serial Printer Logger is ready! After installation start Serial Printer Logger from the Start Menu. Click the green plus button and choose the communication parameters for your dot-matrix printer. Then define how you want the serial data to be logged (binary log file, RTF or PDF). Various OS. Works on all Windows versions since Windows 2000, including x86 and x64 platforms. Windows service mode. 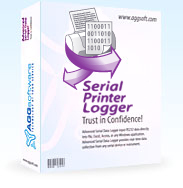 Unlike most other serial logging applications, Serial Printer Logger can run as a service so that it starts as soon as the operating system starts and doesn't require a user to log in and run it. It will continue to run even as users logon and logoff the workstation. It is extremely easy to use! The configuration process is fully menu driven and has complete, context sensitive, on-line help. You can easily customize all input to your exact specifications. Once you see how easy it is to use Serial Printer Logger, you will never again take data readings by hand!